I headed to Whole Foods this week to make amends. These are the days of atonement, afterall. You see, two weeks after the previous time I had been there, I found two packages of rotting tempeh in the canopy of my stroller. Ew. Not only did I manage to steal the tempeh, but I let them rot too. But all’s well that ends well, because on my way to the register with my new two packages (and my intentions to pay for four), along with a cart full of other over-priced items, I found the perfect use for tempeh: barbeque tempeh salad with roasted veggies. You know those prepared salads near the cheese section at Whole Foods? Well, that’s me, standing there, drooling. Lucky for me, they post the ingredients. The best ideas in life are for copying, right? Heat oven to 350 degrees. Mix together the ingredients for the sauce in medium bowl. Dice the tempeh and let it marinate in half the sauce for 20 minutes. Save the other half for later. On a large tray, spread out tempeh on one side and diced onions and halved and seeded peppers on the other. Drizzle sea salt and olive oil on the onions and peppers. Roast for 20 minutes, until vegetables start to brown. Do not let tempeh burn. Steam green beans and 2 cloves diced garlic until just cooked (3 minutes). Remove from water. Heat sesame oil over medium flame and saute beans and garlic mixture for one minute. Add soy sauce and saute one minute more. 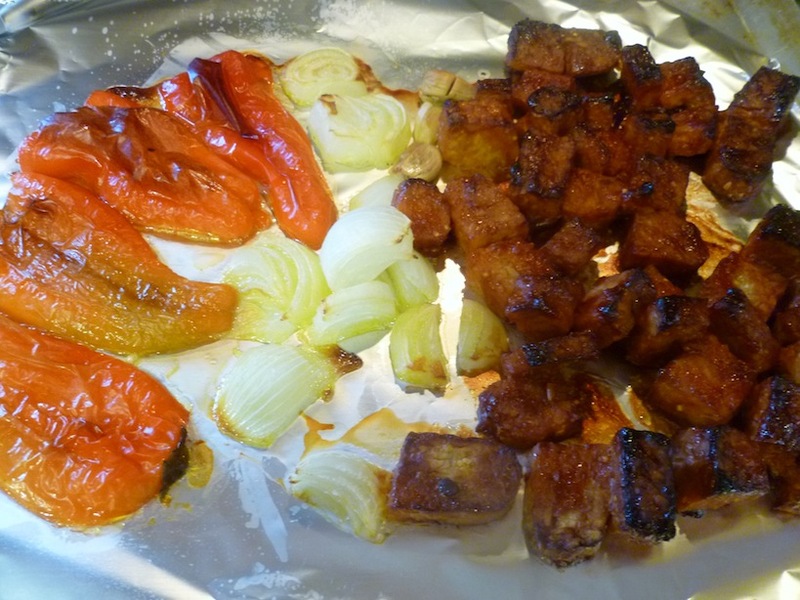 Once the veggies and tempeh are done, remove from oven and peel off the skins from the peppers. Slice the peppers once they are cool. 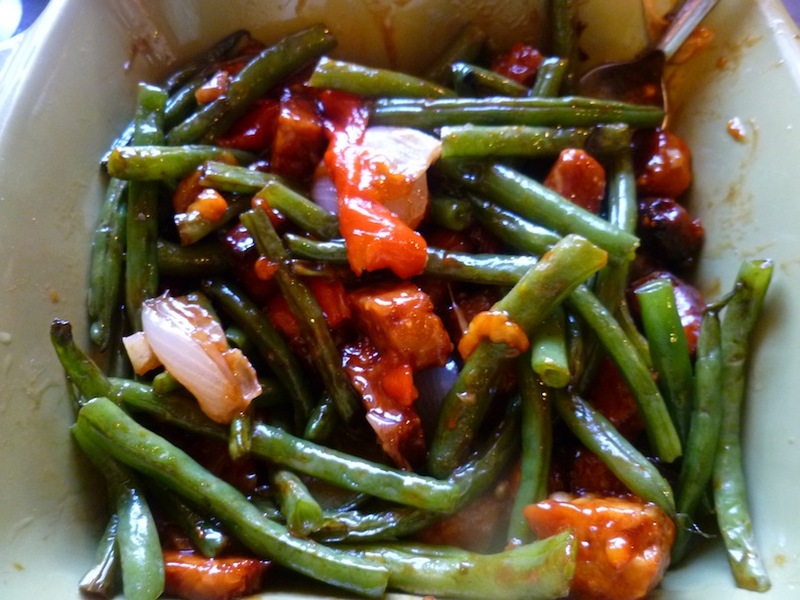 Combine the green beans, tempeh, peppers and onions and add remaining sauce. Serve at room temperature. I also marinate it in 1/4C each soy sauce & maple syrup, 3 tsp each garlic & ginger. I use this for tofu and chicken also. it is the best marinade recipe I have used. It’s always good to have a few ways to make tempeh that way no one gets board and it looks like something new!! thanks, Faith. that’s basically my usual recipe too. It was fun doing something totally different this time. g’mar chasima tova! I like it when you go heavy on the ketchup.